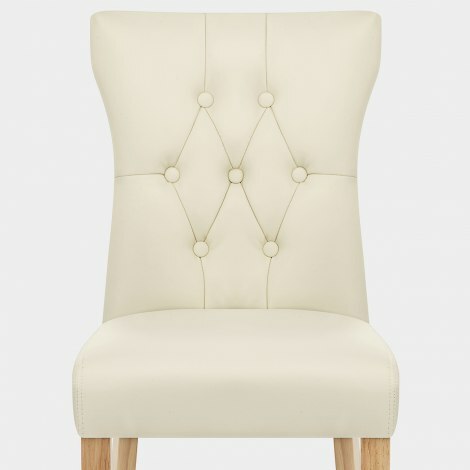 The Bradbury Oak Dining Chair Cream is an outstanding design with classic yet timeless styling and incredible comfort. Set to make a lasting impression on your dining area and beyond, the Bradbury is a high-class piece of furniture with real refinement. 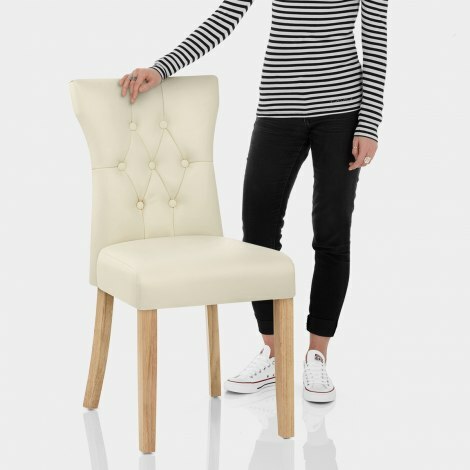 Set on a webbed frame, the padded seat is remarkably comfortable and is covered with gorgeous cream faux leather. Lending an air of tradition, the elongated backrest has a stylish wing design that is decorated with refined button and stitch detail. Below, a warm oak finish lends a rustic look to the four wooden legs and complements the cream seat. Finally, in an effort to preserve floor surfaces, the underside of each leg includes a protective plug. "Love the chairs they go perfect round our dinning table"
Very pleased shopping at Atlantic excellent service and very pleased with the chairs I bought. We were looking for two narrow dining chairs. These chairs are really great, after being assembled, very comfortable and nice to look at. Delighted with chairs very well made and delivery was on time. Love the chairs they go perfect round our dinning table they are of good quality for the money and overall service was very good thank you.